Those of you who are not familiar with any of these description, probably wonder what is this item. Unfortunately, the description will not do it justice, as it sounds worse than it really is. Kobasa (as I refer to it), is a pork sausage, made out of pork meat and some pork fat, flavored with lots of garlic, salt and pepper, stuffed in an artificial or natural casing, and smoked to perfection. Some butchers like to add some beef to their kobasa, and now you can also find veal, chicken, and turkey sausage (but I personally would not call these kobasa). My dad made the BEST kobasa, and all the folks who were lucky enough to taste it, would definitely attest to that. 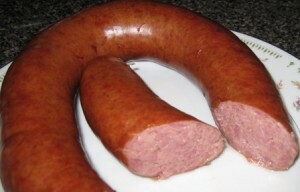 Kobasa, being smoked, may be used as is, cooked, baked, or used in other dishes. 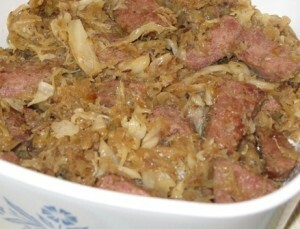 The Ukrainian and Polish cooks like to prepare it with sour kraut, and serve it as a hot meal. If you are in NYC and would like to have an authentic Ukrainian meal, please stop by Veselka Restaurant. 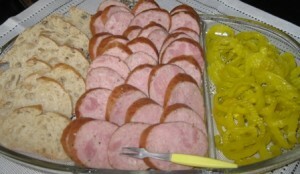 If you visit Ukraine or Poland, you will find kobasa available for breakfast, lunch, or dinner. Having sliced kobasa with fresh rye bread, fresh slices of tomatoes, and cheese, is a standard breakfast menu. Scrambled eggs with sauted kobasa is great as well. Kobasa is used in Eastern Europe on daily basis, just like hamburgers in the US. So, if this stuff is so good, where does one find it? Well, you already have seen all different brands of “Polish Kielbasa” in your favorite grocery store, but the ones I have tasted don’t come close to the ones you can find at a Ukrainian, Polish, or German butcher shop. My favorite one is Ukrainian or Polish kobasa, as they are flavored just the way I like it, and smoked with the right kind of wood. Most larger cities have these butcher shops still available, but because more and more people are being health conscientious, and do not consume as much of these products as they used to, the number of these privately owned specialty shops have dramatically decreased. I will list some of the ones I am familiar with, and would love my readers to utilize the comment section of this post, and provide contact information for their favorite butcher shops in their location (even if you live in another country, it might benefit other people living there and searching for this information). That looks good! Not as good as our version of sausages here. I wish you would tell me more about the sausages you get where you are. You are right Suburban Grandma you talking about the tasty food sausage, in our Nepal we can find buff, chicken, pork, mutton etc. in different styles. But however it looks or it’s name but it have really tasty body to eat thats all. Sounds like different kind of sausages are popular globally. Everyone loves sausages, no matter where they are and what they are made of. Thank you very much for your wonderful suggestions, and I appreciate your visit to my site. Please stop by again, and tell your friends about it. I wonder if we can get Kobasa in Australia? Very informative, thank you. I’ve been blogging on and off for almost 3 years, but have never had much of a focus – I tend to just write about whatever is on my mind when I feel like writing. I appreciate your time for reading my post and leaving a comment. I wish you would have left a link to your blog, for me to check out. European Meat Market, real deal…Binghamton…excellent! Awesome, for sure….My favorite place on Downs Avenue in Johnson City, NY, to stop and shop for European specialty foods, while visiting Binghamton. where can I buy and have shipped the large Ukrainian Kovbasa which is larger than traditional kovbasa or kielbasa links. It is more the size of a lunchmeat, is smoked and is usually sliced off the roll for sandwiches etc. If you check out the whole post you linked to about Kovbasa, you will find contact phone numbers under each location listing, and I think most of them will be able to ship them to you on dry ice. You say “and smoked with the right kind of wood”, what wood is that? Since I never made kobasa myself, I can not offer advise from my own experience, but my dad told me that the type of wood you use to smoke the kobasa, affects the taste of the kobasa. Some people use cherry wood, others use hickory, and some might find other favorites of their own. I know it needs to be a hard, slow burning wood. Poplar is too soft, and pine is full of sap and burns fast, creating lots of flame rather than smoke, which will adversely affect the taste of the finished product.